We have had a long and warm association with India for many years, and always look forward to welcoming our Indian students to the UK. We have an active Indian Society through our Students’ Union, as well as the Sikh Society, making your experience a home from home. Birmingham has a proud reputation as one of the most diverse cities in Europe, and is home to nearly 65,000 residents of Indian ethnic origin. Indian visitors can enjoy the Balti Triangle, the centre of Asian cuisine, enjoy shopping, Asian jewellers, and delicious sweet shops. Birmingham is home to the world-famous Edgbaston cricket ground, which in 2018 hosted the Investec Test Match between England and India. Our local music and event venues also play host to some fantastic events, including the BritAsia TV World Music Awards 2015 at the Barclaycard Arena. The new Air India service from Delhi flies direct to Birmingham Airport – it will take an estimated half a million tourist trips to Britain each year by 2020. Next to India Vision, Cherooty Road, Calicut, Kerala. Near Jaipur Tower, MI Road. Saran Chamber 2, Park Road. Thiruvananthapuram - 695 001, Kerala. The majority of our programmes require the Indian Certificate of Secondary Education (Standard XII) - minimum average of 55% depending on exam board, however some courses may require a higher grade. Most undergraduate courses in the Art and Design schools require a good portfolio of artwork. Requires the 12th Standard average of 60% with a minimum of 60% in Maths. We also accept Maths at Standard 10 with 65% from Central Board and CICSE Board. Mathematics is required at the 10th Standard minimum of 65% from Central Board and CICSE Board. Some postgraduate courses require a portfolio, others require a proposal of studies while some courses require both a portfolio and a proposal of studies. All undergraduate courses in the Art and Design schools require a good portfolio of artwork. Some postgraduate courses also require a portfolio, others require a proposal of studies while some courses require both a portfolio and a proposal of studies. Please check faculty website for specific requirements. All undergraduate courses in the CEBE faculty require Mathematics at O Level. However for the Engineering suite and BEng Telecommunication and Networks, Mathematics is required at AS Level minimum Grade C or the equivalent. IELTS 6.0 (with no less than 5.5 in each band score). Please note that some courses require a higher IELTS score. If you don’t meet the entry requirements, you can study an International Foundation Programme to be eligible for entry to study with us. Our foundation programmes are delivered through Birmingham City University International College. Your scholarship offer will be made when we make you a course offer. *Computing, Engineering and the Built Environment courses have higher requirements. 5 students will each be awarded their full tuition fee for the first year of an undergraduate course up to a maximum of £12,000. Your course can be from any of the following faculties; Business, Law & Social Sciences (BLSS), Art, Design & Media (ADM), Computing, Engineering & Built Environment (CEBE), or Health, Education and Life Sciences (HELS). In order to participate, you will need to complete in the brief form below and write a supporting statement. 1 student, from any faculty, will be awarded full tuition fees for any postgraduate course up to £12,000. In order to participate, click the apply button, complete the brief form and write a supporting statement. *Please note: this scholarship cannot be combined with any other scholarships or early payment discounts. We’ll be visiting India very soon and we’ll let you know our schedule as soon as possible. In the meantime, please contact Rob, International Regional Manager, for any questions you have. “The University and the city of Birmingham were both very welcoming, with something for everybody. Birmingham is a very student friendly city, full of life and energyThe Hindu temple, Shri Venkateswara (Balaji) on the Dudley Road, made me feel at home and I used to visit it regularly. 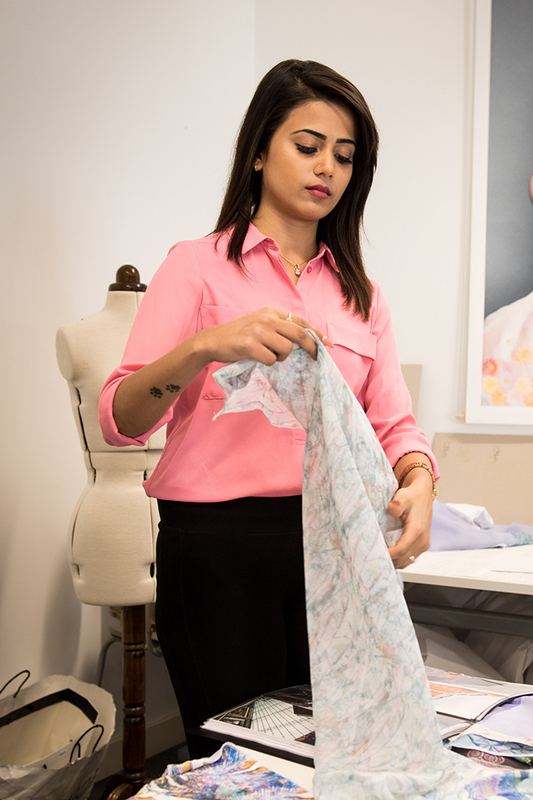 “I'm thoroughly enjoying studying for my degree in textile design at Birmingham City University. The university offers not only an extremely high standard of teaching, it is also a supportive and friendly environment in which to take my academic career forward and maximise my confidence and potential. “Throughout the course I have learnt a variety of skills, both creative and transferable. To open our minds and really 'think outside the box' is at the heart of our design work. Through placements, we have become more prepared and experienced, and ready to adapt to working life and to reach the highest level of professionalism.